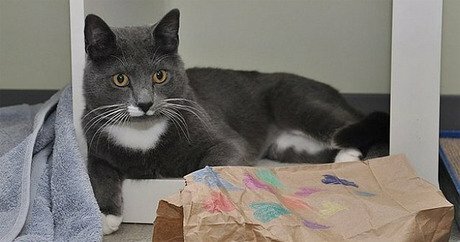 The name of King’s adopter was not disclosed to the public, but the ASPCA believes the feline will live happily ever after. Back in early May, we brought you the story of King, the 1-year-old grey-and-white stray kitty who was injured after 21-year-old Brooklyn resident Andre Robinson allegedly kicked him into the air in front of a Bedford-Stuyvesant apartment building. A horrifying video of the incident went viral, leading to concerned New York City animal lovers and police to work together, leading to Robinson’s arrest. Meanwhile, rescuers scoured the area around the Breevort Houses, where King was last seen, hoping to find the wounded King alive. While veterinarians worried that King may have succumbed to his injuries after suffering such a trauma, King was found and rescued. He received emergency veterinary care at the ASPCA shelter in NYC, where he soon recovered and flourished, becoming the happy, playful cat many Breevort Houses residents remember. Almost immediately after King was made available for adoption, the shelter received hundreds of inquiries from people all over the country hoping to add the sweet kitty to their family. The shelter asked that potential adopters have experience with cats, a single-cat household, and children over the age of 12. Finally, the Huffington Post reports, King has found a forever family to love. Though his new adopter has not been identified in the press, the ASPCA is confident that King is in great hands and is thrilled to have been able to provide a happy ending to such an awful story. “We are pleased to have found a wonderful home so quickly for King,” ASPCA Adoption Center Senior Vice President Gail Buchwald said in a statement. As for Robinson, the cat-kicker who injured King and was subsequently charged with animal cruelty, he arrived in court June 9 to a not-so-friendly greeting. A group of several dozen cat lovers lined the courtroom, hoping for justice. The group plans to be present for Robinson’s subsequent court appearances. They hope the cat-kicker will be convicted and sentenced to at least one year in prison, the maximum sentence.